One of the biggest reasons I got into woodworking was because I was trying to find nice, attractive, durable furniture on a strict budget and just could not find what I wanted. If I could afford it then it usually wasn’t high quality, and if it was high quality then I usually couldn’t afford it. 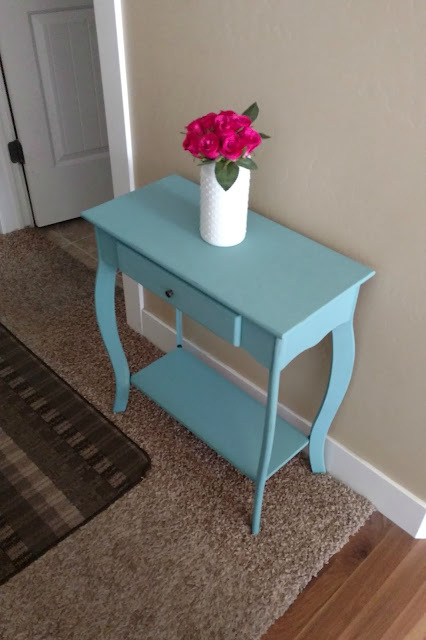 The furniture I have been able to DIY has been sturdy, affordable, customized to my space and gives me an awesome sense of accomplishment as well. Win, win, win. Is it always perfect? No. But it will definitely outlast the cheap particle board furniture from the local store, so that is what keeps me building. There may be affiliate links in this post. If you purchase something through them I get a small commission at no extra cost to you. See my Disclosures page for more info. 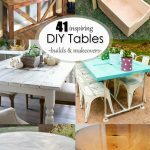 Recently, I have been looking at DIY table builds and makeovers and have found a plethora of great plans and techniques. I figured I’d put together a great collection of them to share with you and hopefully make your search a bit easier. Some of these are easier than others, but if you find one you like I encourage you to give it a try! There are a bunch of ideas here, so I sorted them by the type of table. Scroll to the section you’re looking for or look through all of them, your choice. Enjoy, and happy building! 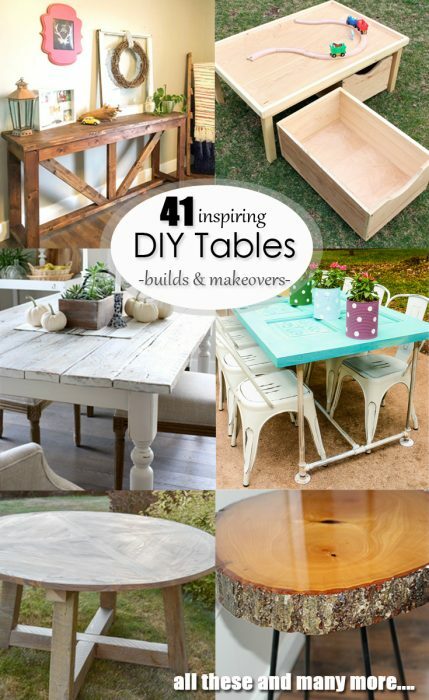 41 Inspiring DIY Table Builds and Makeovers! 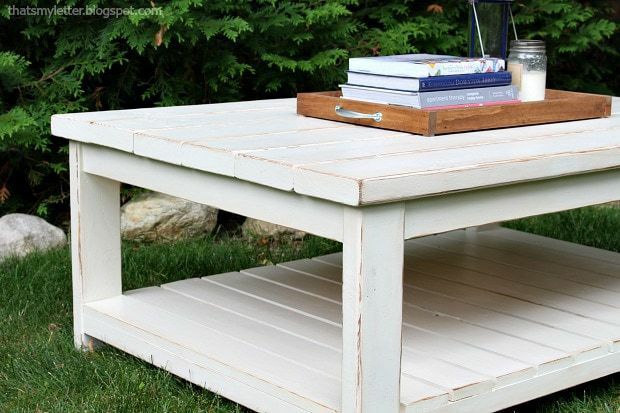 Check out How to Build a Outdoor Farmhouse table by The Handmade Home. I love the two-toned look! Amber Oliver hit it out of the park with these simple Outdoor Farm Table Plans. 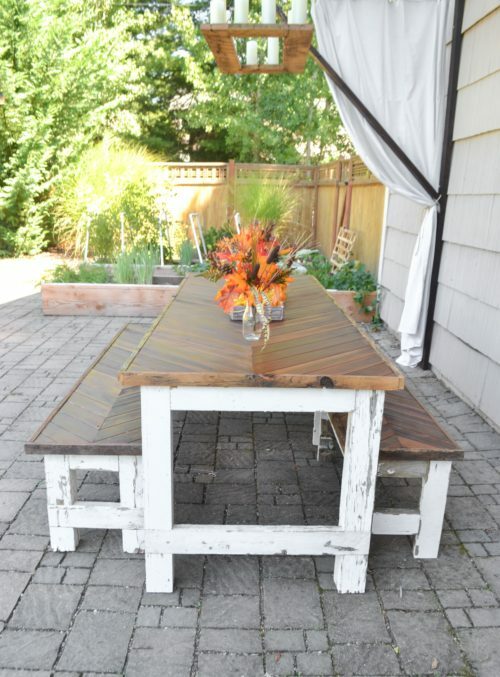 This Rustic Salvaged Outdoor Dining Table by The Created Home is beautiful with that chevron top. 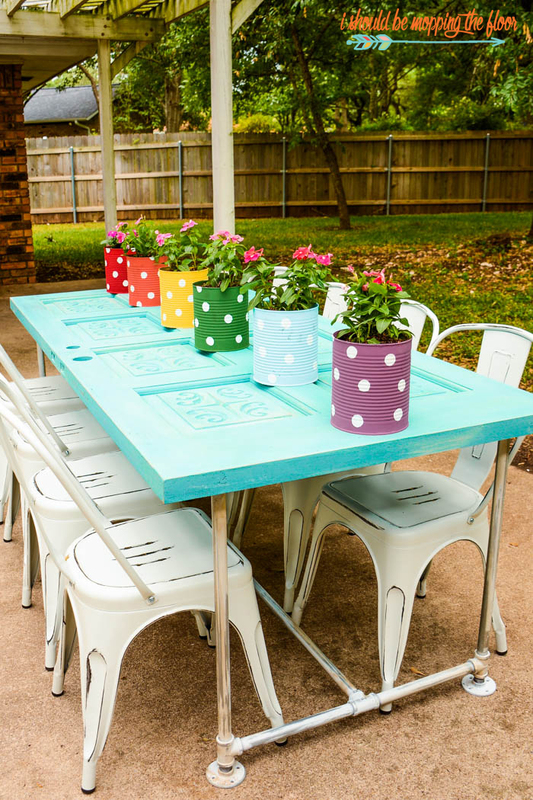 Another outdoor dining table, but this DIY Large Outdoor Dining Table by Pinspiration Mommy has a gorgeous leg design. I Should Be Mopping the Floor shared this amazing Patio Table made from an Old Door. 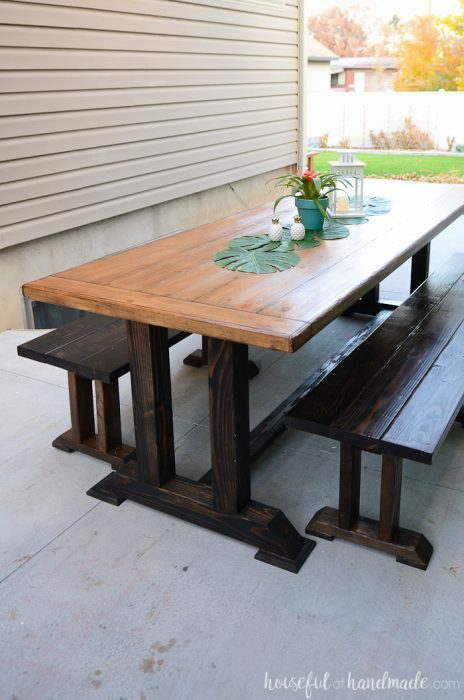 I love the two tones of stain on this Outdoor Dining Table Plan by Houseful of Handmade. 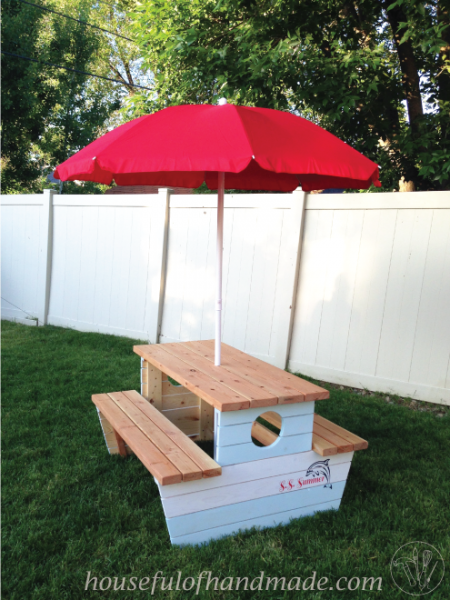 Build a Nautical Picnic Table for bigger kids from the plans at Houseful of Handmade. 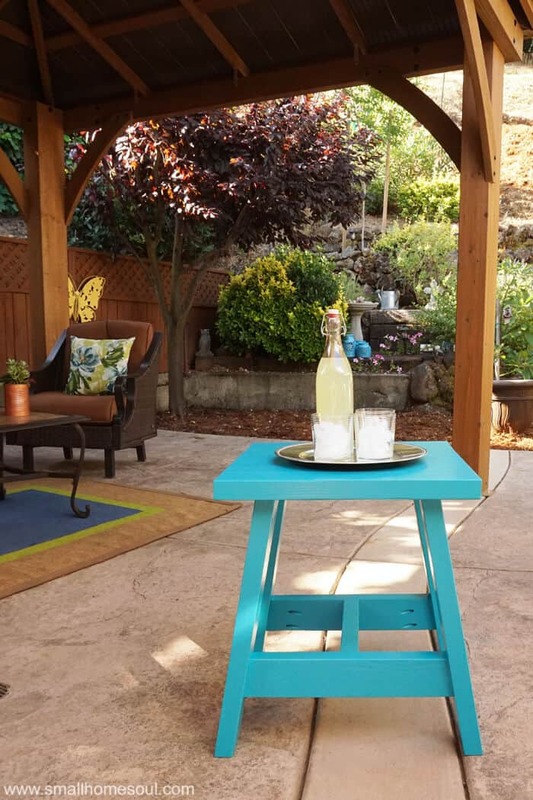 Love this teal Outdoor Side Table by Small Home Soul, get the plans on her site. This Birch Plywood Dining Table by Boxy Colonial was made from ONE SHEET of birch plywood. So awesome. 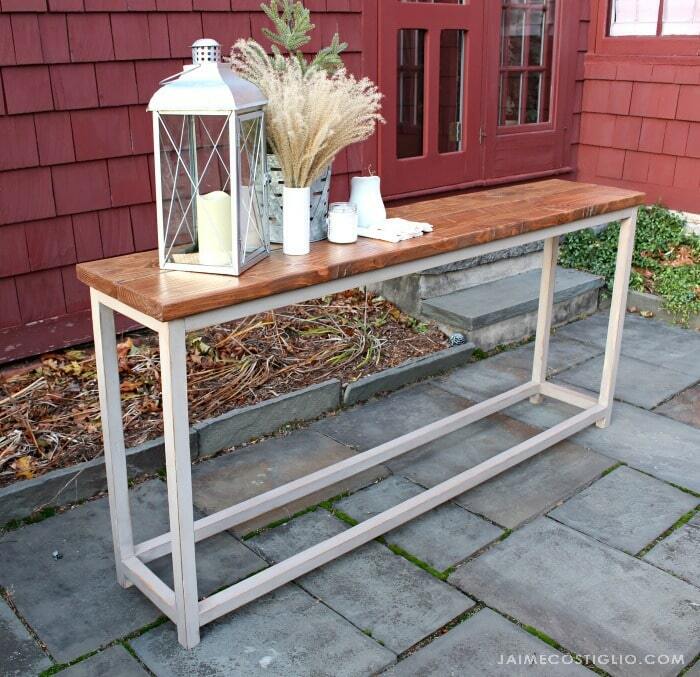 Check out this Zinc Table Top build by Savvy Apron, it is simply awesome. This awesome kitchen table by Seeking Alexi is definitely something you can DIY! 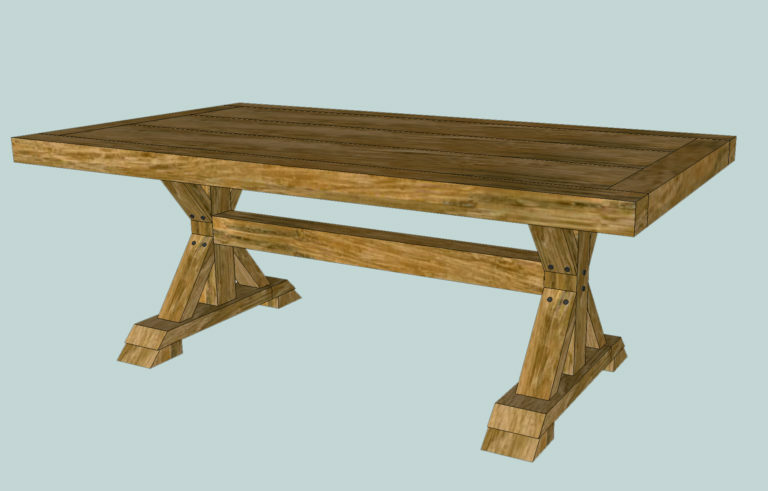 This Round Dining Table make with Salvaged wood beams is gorgeous. Sarah at The Created Home is crazy talented. Another round table, this Round Farmhouse Table by DIY Swank is awesome too. I love the grey stain! 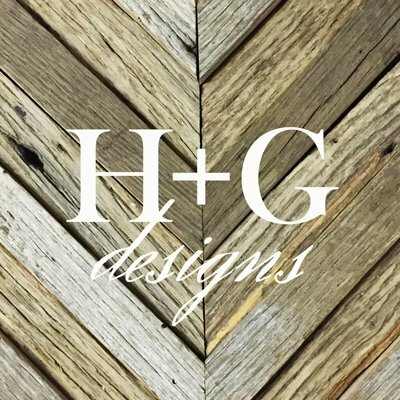 Do you love farmhouse style? 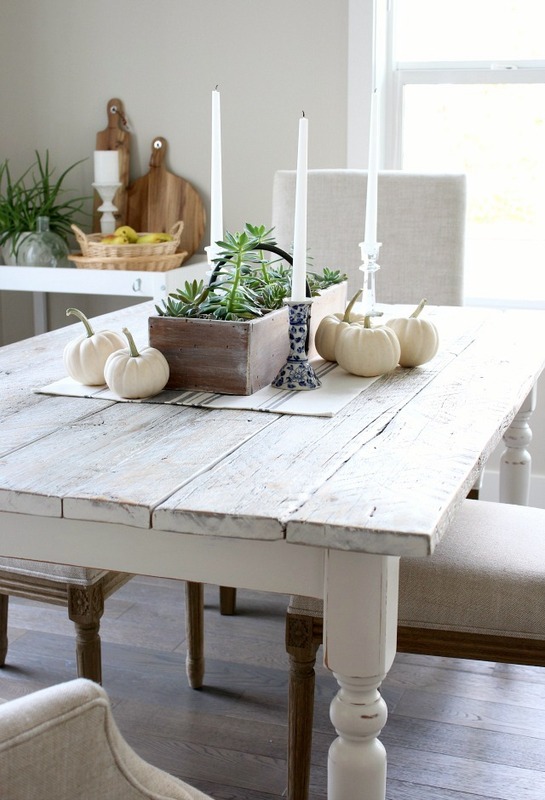 This Chunky X Farmhouse Table on Pretty Handy Girl is perfect for you. This dining table by Our House Now a Home is another farmhouse style table but slightly different. I love the leg space underneath. It’s not a build, but this damask painted table by Just the Woods just had to be included in this collection. It’s so pretty. 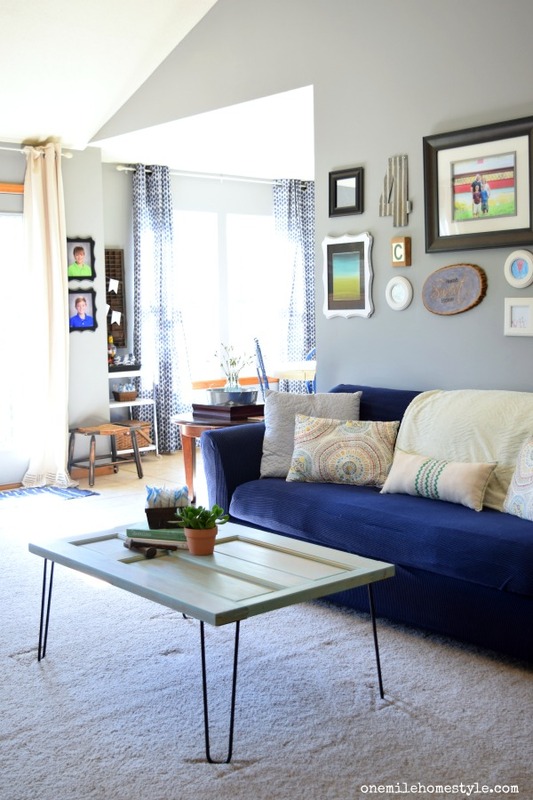 She also has a great post on how to transfer images to furniture. 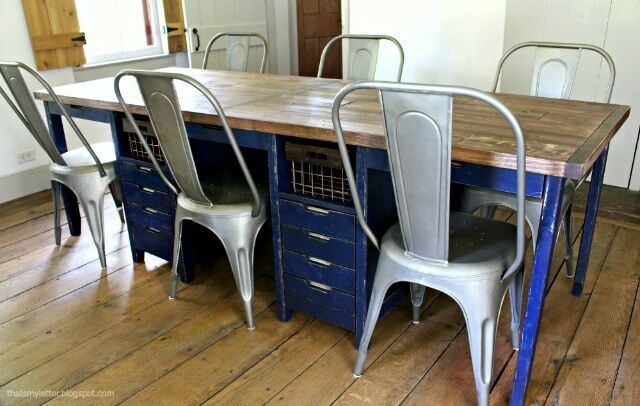 This is a great Kitchen Table Makeover by Roots and Wings Furniture, check it out if you have an old table to refinish! 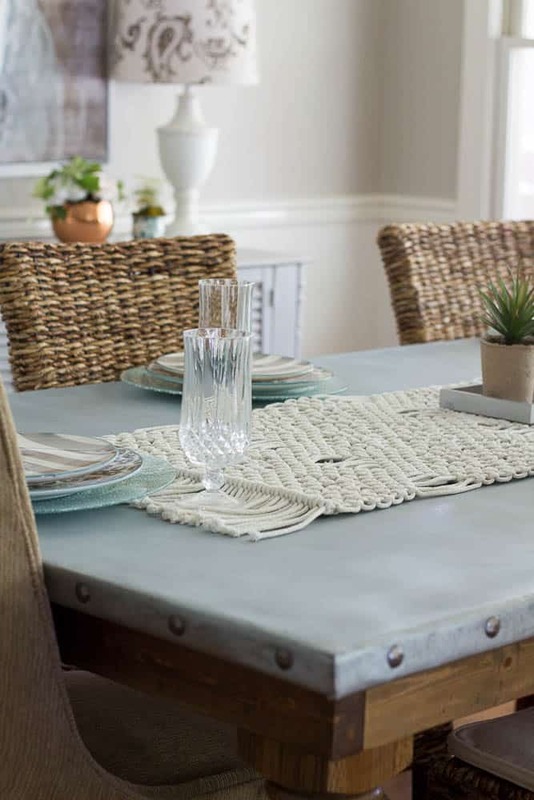 Learn how to do a Whitewashed Reclaimed Wood Table Top from Satori Design for Living. 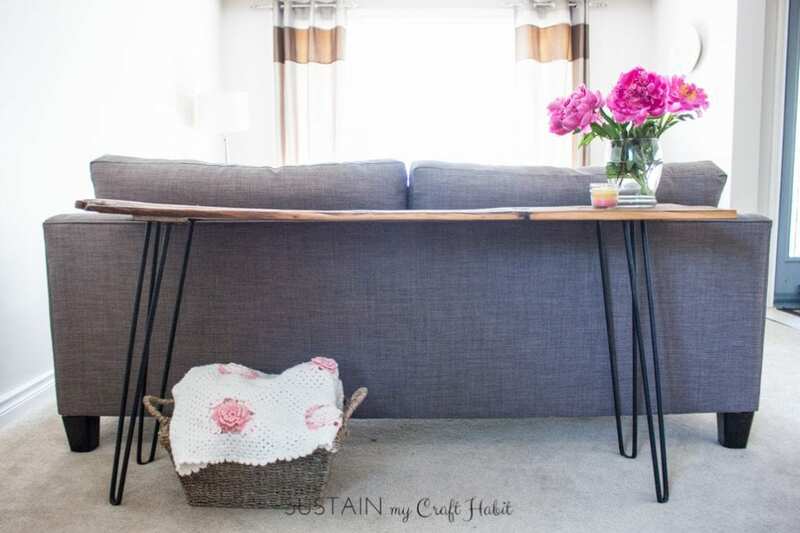 Fix This Build That has great plans for this DIY Truss Sofa Table, go get ’em! If you like an industrial vibe, check out this DIY Sofa Table with Pipe Frame by Sawdust Sisters. 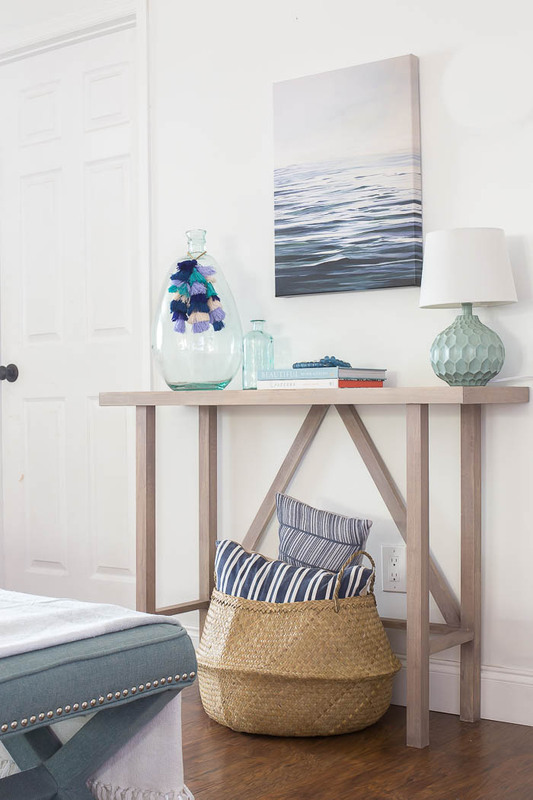 If you love the beachy style, check out this Beach House Style DIY Console Table by Making Home Base. This Navy console/sideboard table by Jaime Costiglio is perfect for a small busy room. Love it! 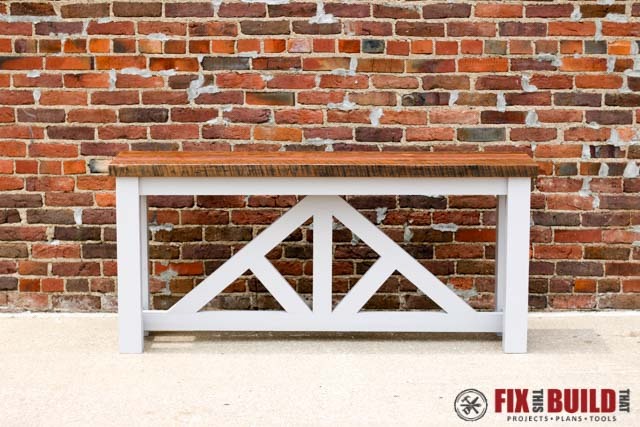 This gorgeous Farmhouse Console Table is made by standard 2x4s, check it out by A Turtle’s Life for Me. This Simple Sofa Table by Jaime Costiglio is gorgeous and could be used with many design styles. Make a Barn Wood Console Table with these modern hairpin legs like Sustain My Craft Habit did here. 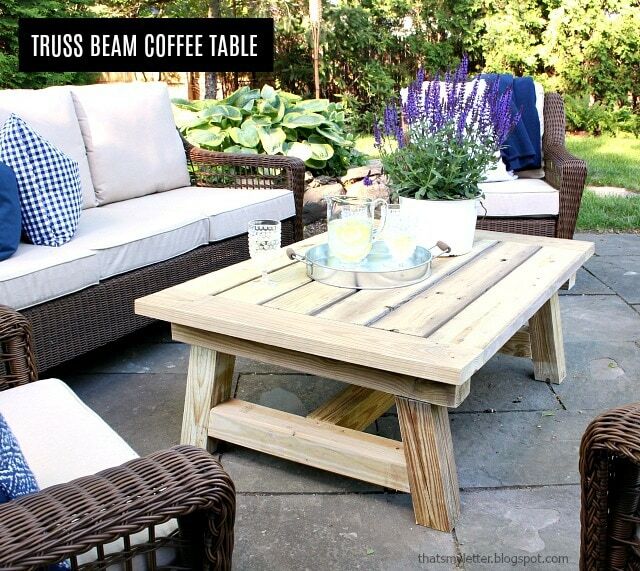 Great for indoor or outdoor, this DIY Truss Beam Coffee Table by Jaime Costiglio is sturdy and beautiful. 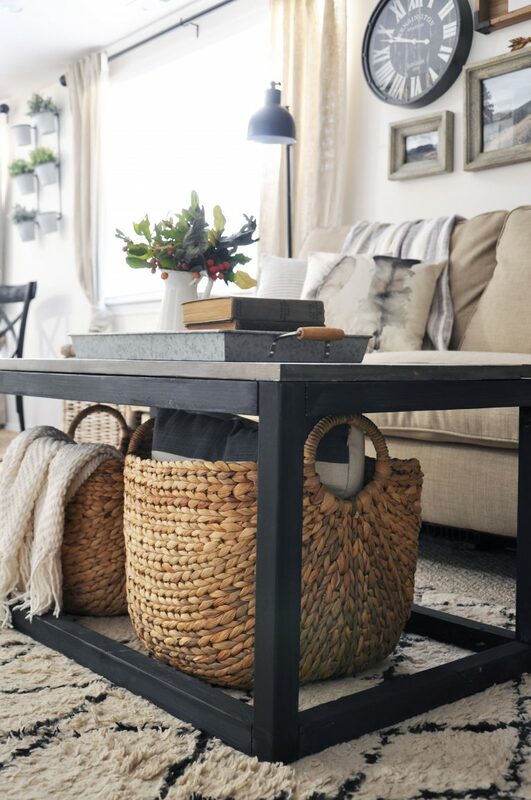 Jaime Costiglio design this DIY Habitat Coffee Table Plan and it is awesome. Check out this Gator Hide Refinished Table by Love My Simple Home. You’ll want to know what Gator Hide is! 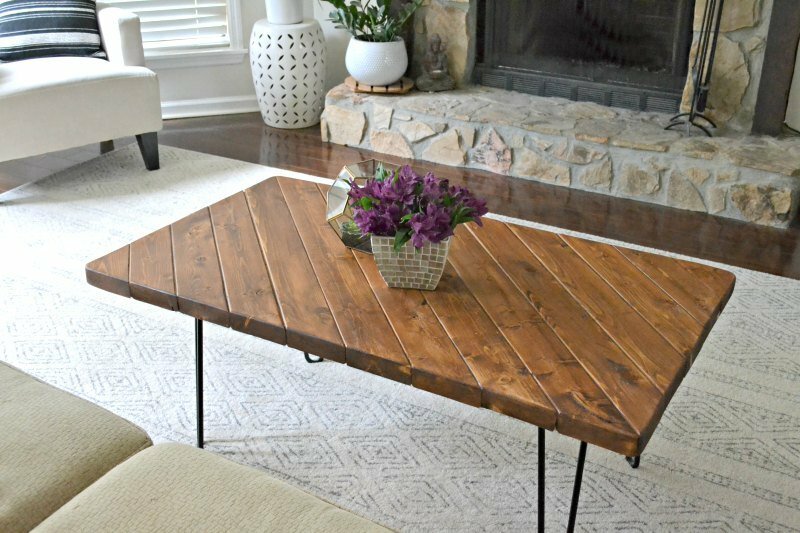 An Industrial Farmhouse Coffee Table like this one by Cherished Bliss is just beautiful – and she shares free plans! 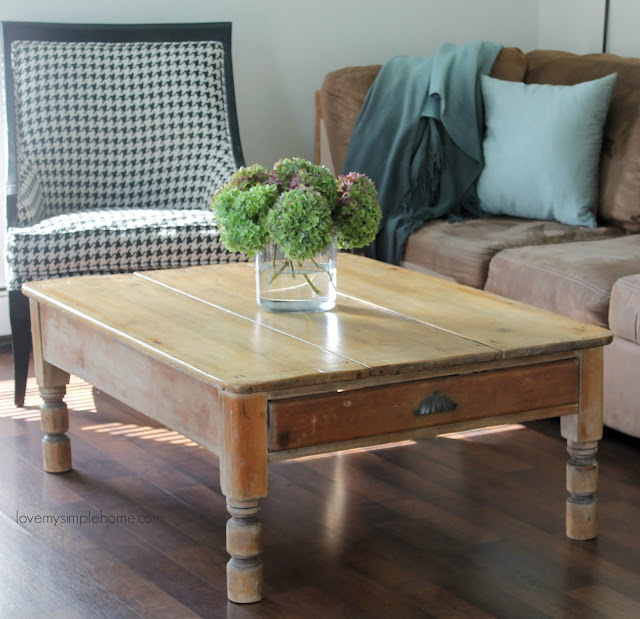 Love this tutorial on turning an Old Door to a Coffee Table by One Mile Homestyle. Use 2x4s to make this amazing 15-minute Coffee Table by Ugly Duckling House. 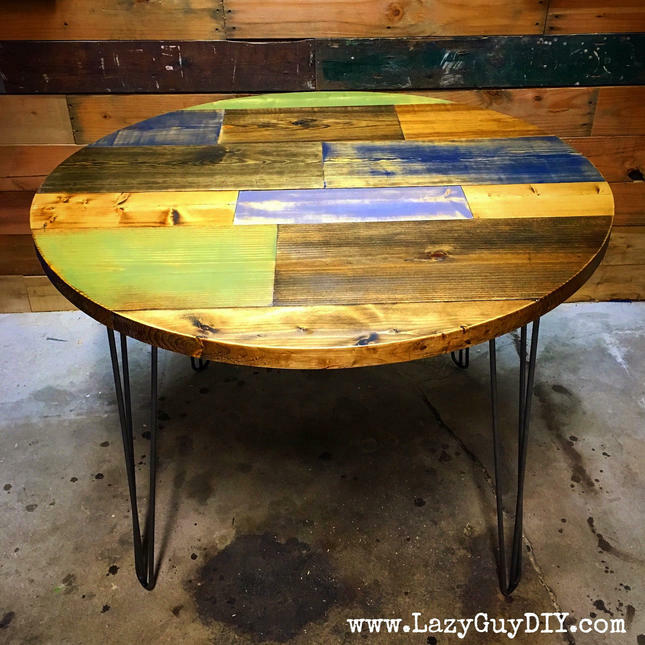 This Round Top Timothy Table by LazyGuyDIY is great for a multitude of purposes. If you need a great workspace, check out this DIY Multipurpose Work Table by Jaime Costiglio. Learn how to build a Round Table Top from Roots and Wings Furniture. 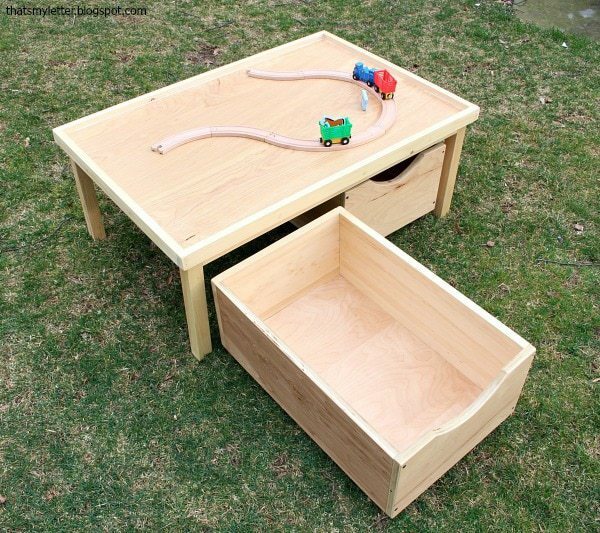 This DIY Play Table with storage bins for your kids’ area is perfect! Check out Jaime Costiglio’s plans. 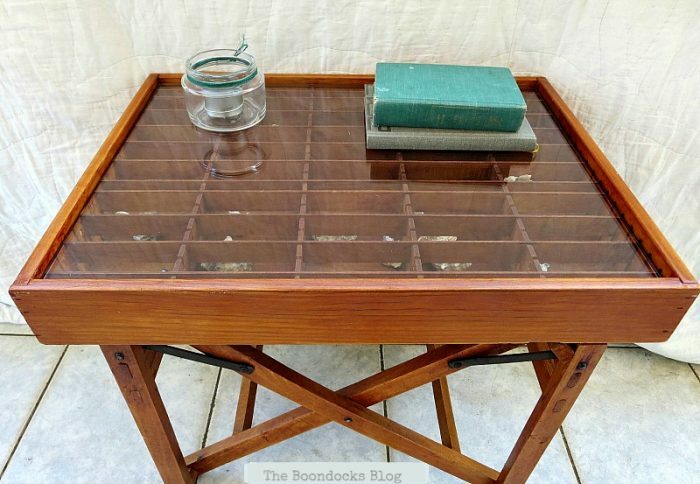 Repurposing at it’s finest, check out this Showcase Table made from a cassette organizer by The Boondocks Blog. 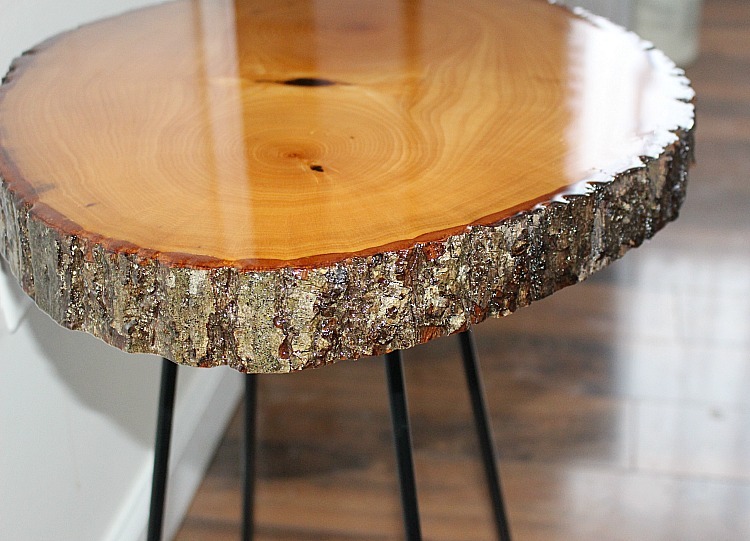 Check out this Wood Slice Side Table covered in Resin by Our Crafty Mom. It’s shiny and beautiful! 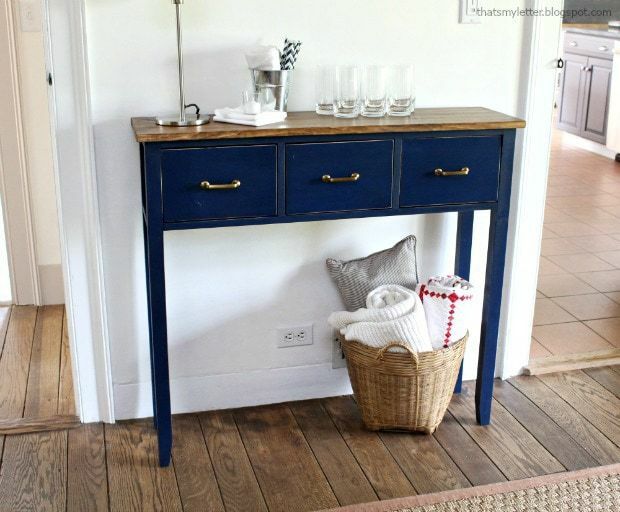 Makeover a Hallway Table like Sunshine and Munchkins shows you in her tutorial. This Pencil Leg Kids Chalkboard table by A Crafty Mix is absolutely adorable. Any kid would love it! How creative is this Floating Bedside Table by FrugElegance? 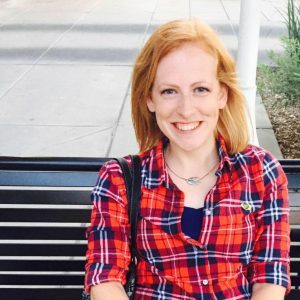 Check out how she made it! How cool is this unique Upcycled Side Table by Honeycomb Home? Check out what she used to make it. I hope you liked these tutorials as much as I did. No matter what your needs are or what you already have, you can always build or makeover something to have something even better. Let me know what you think! Did you love any of these? Will you make it? Please share this image on Pinterest and let more people know about these! Keep building, my friend! See you soon. 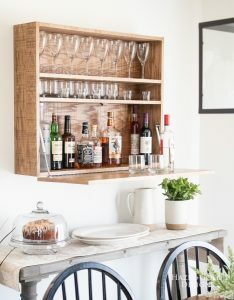 Love all these ideas…especially because I am moving into my new house in a few weeks! Great post 🙂 PS- I found you on Reader Tip Tuesday!! Yay! New houses are so much fun! Best of luck with your move. And thank you! So many fun ones! Thanks for sharing with SYC. 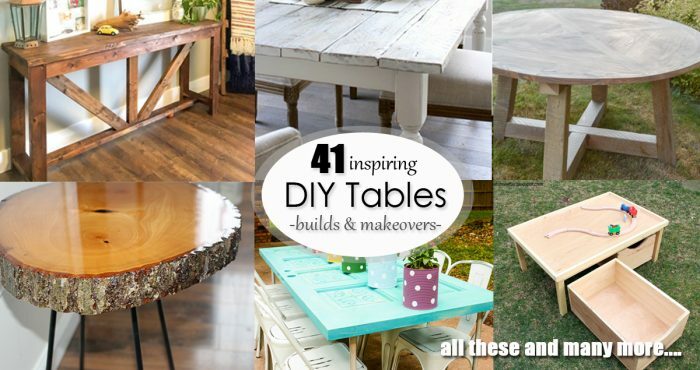 Great collection of table ideas here! My husband made us a kitchen table years ago and it came it wonderful! Thank you Karen! There’s just something about a nice, solid table for the family to gather around. So many amazing alternatives! 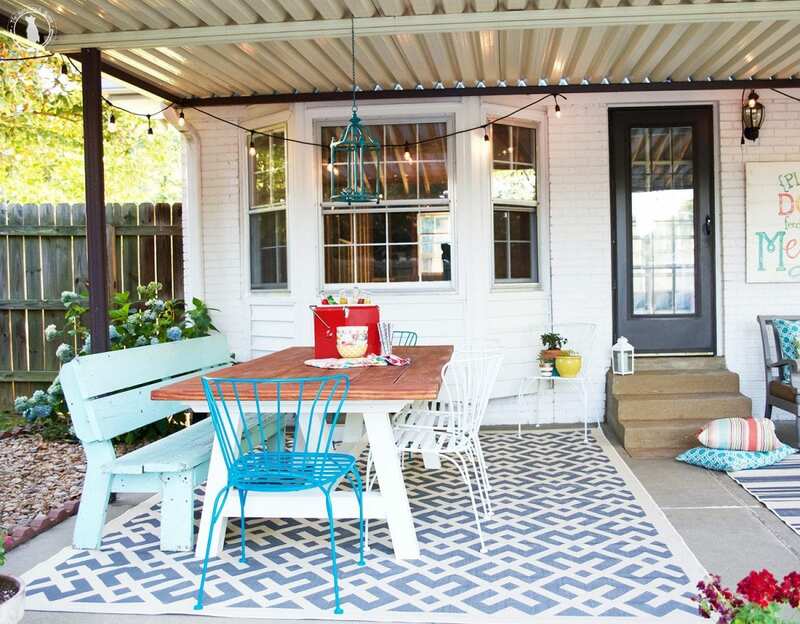 My favorite is the one with the polka-dot planters, it looks perfect for spring and summer. 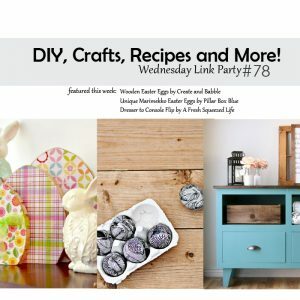 Thank you for sharing the inspiration at The Really Crafty Link Party. Pinned! Although I’m not talented in the carpentry area, Sheri, I totally understand what you mean about particle board furniture! It’s wonderful that you can make your own. Love so many of these inspiring projects – especially that gorgeous damask painted table and the beautiful blue sideboard. Pinning and sharing. 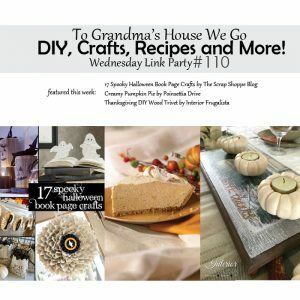 Thank you for being a part of the Hearth and Soul Link party. 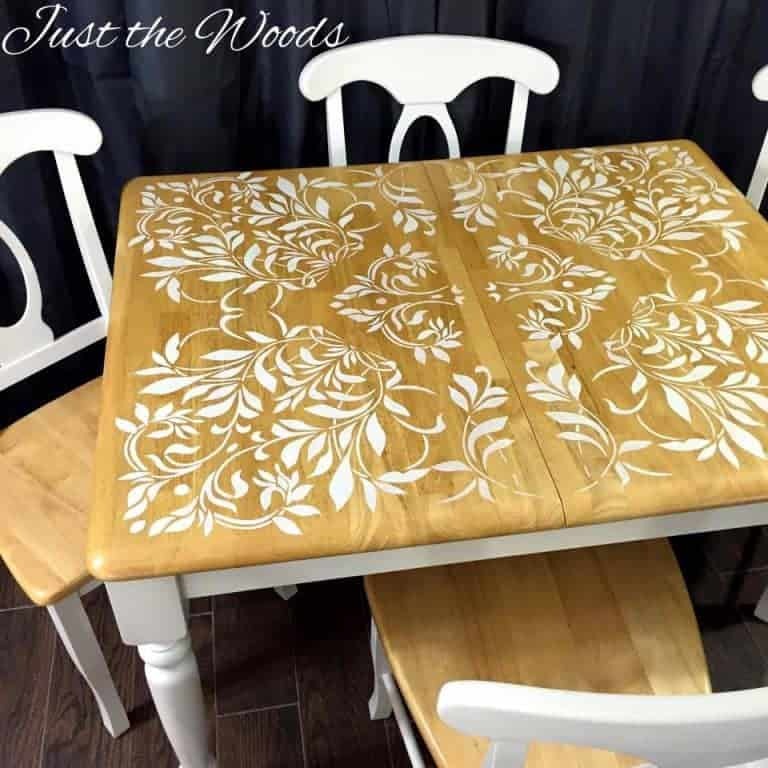 Oh the stenciled table is gorgeous! Thank you so very much for linking to the Spring and Easter Joys party. Have a very Happy Easter! Sheri thank you so much for putting this together. It just goes to show that when we put our minds to it we can create anything. So much inspiration here. Thanks for including my showcase table. It’s a great plan! Thanks for sharing!